Summit Ave. and Skyline Blvd. Hendricks Park is Eugene's oldest city park. Its 80 acres includes a world-renowned rhododendron garden and a native plant garden. Laced with paths and the northern terminus of the 12-mile Ridgeline Trail, the park is a haven for hikers, birders, and others who enjoy retreating to the tranquility of nature. Without leaving the city, visitors can walk among 200 year-old Douglas fir trees, ferns, and wildflowers such as trilliums and irises, and over 6,000 varieties of rhododendrons and other ornamental plants. 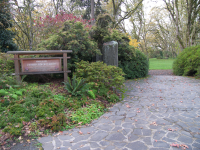 With the implementation of the Hendricks Park Forest Management Plan in 2000, park staff have worked in partnership with the Friends of Hendricks Park and other community volunteers to help achieve a healthy, resilient, and sustainable forest. The forest management plan will ensure that Hendricks Park's pristine natural setting, truly a community treasure, will be preserved for generations to come. Originally constructed in 1938 in honor of Francis M. Wilkins, one of the founders of Hendricks Park, the historic shelter includes a large fireplace and the Moon Terrace deck, both constructed out of natural stone. It is available to rent year-round, excluding Sundays in April and May. Hours are 9 a.m. to 10 p.m., 60 person capacity. For rental information call 541-682-4800. Pets, sports, games, and organized group events such as weddings are not allowed in the rhododendron garden.